from Russia with love: 17 days till the Victory Day ( 9 of May). 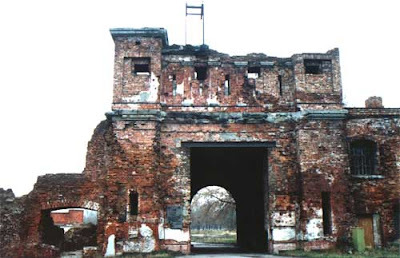 Fascist headquarters planned to seize Brest and the Brest Fortress which was located in the direction of the main attack of the Army Group Centre during the first hours of the War. The day Germany attacked the Soviet Union there were 7 rifle battalions, 1 reconnaissance and 2 artillery battalions, some specialised submissions of Rifle Regiments and Corps subunits, due of the 6th Orlov Redstandard and 42 Infantry division of the 28 Infantry Crops of the 4th Army, subunits of the 17th Redstandard Brest Frontierguard detachment, the 33 Separate Engineering Regiment, a part of the 132 Battalion of the troops of CGB (headquarters of the divisions and the 28 Infantry Cops were located in Brest). The military units were not launched in a war way and they didn't occupy the positions on the border line. Some of the units were assigned to defence construction works and were in training. On the night of the attack there were 7000-8000 men from various units including personnel of the garrison hospital and medical unit. More over the families - wives and children - of the servicemen were inside the fortress. Since the first minutes of the war Brest and Brest Fortress were bombed and fired from artillery guns. Severe battles were launched at the border line, in the town and in the fortress. The 45th Division formed in Hitler's homeland occupied the very centre of the attack. This Division had been active in the occupation of Poland and France. Now it undertook the storming of the Brest Fortress, for which it was equipped with the 12 batteries of artillery, 9 batteries of the 4th Specialised Chemical Regiment, several powerful 550-600-millimetre Tor guns capable of shooting high-explosive and bunker-bursting shells weighting 1,250-2,200 kilogrammes. Five hundred guns capable of firing 4,000 shells per minute were trained on the fortress. Massive air coverage was provide for the 45th Division. The 45th Division was supported by the 34th and 31st Divisions of the 12th Army Infantry Corps from the flanks as well as it was supported by the 2nd Panzer Group led by Guderian. During half an hour the enemy had an aimed fire at the entrance gates bridgehead fortifications, bridges, artillery and autoparks; warehouses with the ammunition; medicine, food; at barracks, dwelling houses of the commanding officers. The squall of the fire was moved 10 minutes deeper each 4 minutes, it was followed by the assault groups of the enemy. As the result of the artillery shooting, fires the greatest number of warehouses was ruined and destroyed. The water supply didn't function, there was no connection with the Headquarters. The majority of the soldiers and officers were out of action at the very beginning of the war and they were separated but organised the defence of the independant spots. Immediately after the beginning of the military offensive the frontierguards were the first to resist the attack in the western direction (the Terespol Bridgehead fortification); the Red Army men and cadets of the regiment schools of 84th and 125th rifle regiments which were located not far from the western border on the Volyn and Kobrin bridgehead fortifications. Stubborn resistance gave an opportunity to the half of the garrison to withdrawn from the fortress and to take with them guns light tanks to the regions of concentration to evacuated the first wounded. Only 3,5 - 4 thousand Soviet soldiers stayed in the fortress. The enemy had ten time numerical superiority. Their aim was to occupy the Citadel first using the advantage of their sudden attack. And after that to make other fortifications surrender. The first day of the War the fortress was rounded up. At the same period of time there were severe battles on the whole territory of the Fortress. From the very beginning it was the defence of the separate fortifications without general headquarters without contact with each other. The leaders of the defence of this or that fortification became officers or political instructors in some case those were soldiers. By the end of the 22nd of June the enemy occupied the position in the barracks between Kholmsky and Terespol Gates. Then some sections of the defence barracks near the Brest Gate. There were 300 frontier guards fighting on the Terespol fortification. Before the War on the Volyn fortification there were hospitals of the 4th Red Army and the 28th Infantry Crops, the 95th Medical Battalion of the 6th Infantry Battalion. There was a training school of junior commanding officers of the 84 rifle regiment, some frontier guards. The platoon of the regimental school was defending the position at the Southern Gate. There was a necessity of uniting the forces of the separate defence positions. There was a meeting of the commanding officers and political instructors where they decided to create a joint command for the defence of the Central Island. There was signed Directive 1. The Directive said that the commanding officers decided to place all their individual units into one large, joint-fighting force. Captain Zubachov was appointed commanding officer of the force. Commissar Fomin was appointed his assistant. After three days of fighting, Joachim von Ribbentrop, the nazi Minister of Foreign Affairs, held a press conference in Berlin to announce that Russian resistance along the border had been broken. However, it was on this day that a joint command was created for the besieged garrison at the Brest Fortress. The Citadel's defence acquired a more organised, well-conceived character. Even though the commanding officers of the joint force didn't manage to unify the defence throughout the fortress - the fighting became more and more intense, and with it the disposition of the fighting defence units - nonetheless, the creation of the headquarters staff and the Directive played a major role in the defence of the Citadel, strengthening it, and making it both more stable and more flexible. At noon on June 26 an advance unit of 120 men rushed out of the Brest Gate in the direction of the bridge. Machine-gunners covered the attacking troops with fire. Only a few small groups, however, succeeded in fighting their way through the solid ring of the enemy troops, and at a great loss in human life. In the Northern part of the main earthwork ramparts in the region of the Northern Gate there were fighting groups of soldiers from different units under the leadership of the major P. Gavrilov. On the third day of the War the defenders of the Northern part of the earth work retreated to the East Fort, where there was the 393rd Anti-Aircraft Artillery Battalion, a transport company of the 333rd riffle regiment training battery of the 98 Independant Anti-Tank Artillery Battalion, soldiers of other units there were families of the officers. The number of the defenders in the fort was about 400 people. The leaders of the defence in the East Fort were major P. Gavrilov, political instructor S. Scrypnik - 333 infantry battalion and the commanding officer of the 18 Independant Communication Battalion. The commander of the nazi 45 Infantry Division wrote in his reports: "It was impossible to advance here with only infantry at our disposal because the highly-organised rifle and machine-gun fire from the deep gun emplacements and horse-shoe-shaped yard cut down anyone who approached. There was only one solution - to force the Russians to capitulate through hunger and thirst. We were ready to use any means available to exhaust them... Our offers to give themselves up were unsuccessful..."
The Hitlerites were attacking the Fortress during the whole week. The Soviet soldiers had to repel 6-7 attacks a day. There were women and children helping soldiers. They looked after the wounded, loaded the machine-gun discs and belts with cartridges and even took up rifles to help defend the Fortress from enemy attacks. Children who had only a few days before been at school helped bring ammunition and food supplies from half destroyed supply depots, searched for and brought weapons and watched enemy movements. On June 27, the enemy began to use 540 millimetre guns which fired shells weighting 1.25 tons and 600-millimetre guns which bombaded the Citadel walls with concrete-piercing shells weighting over 2 tons. The situation inside the fortress became even more grave. By the end of June the enemy seized the main part of the fortress. 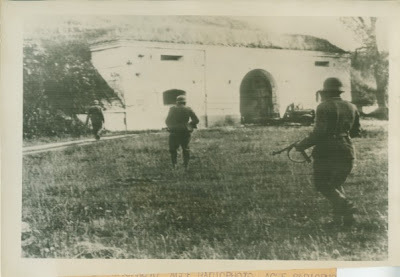 On June 29, the enemy delivered an ultimatum to the fortress defenders: the besieged troops would have to surrender or else the fortress would be totally destroyed. On June 29 and 30 the Germans undertook the assault. The major groups defending the fortress was gradually being destroyed and broken up, and the headquarters was smashed. The Citadel didn't raise the white flag. Dozens of bombers circled over the fortress and showered powerful bombs onto it. Enemy tanks penetrated the Citadel's courtyard and fired continuously in the region of the Brest Gate. "June 30. The assault was readied with petrol, oil and grease. All this was rolled into the forts trenches in barrels and bottles, which we expected to bum with granades and incendiary bullets". After fierce continuous fighting the enemy troops occupied most of the fortress. But the fighting went on even though instead of a joint defence there were only isolated centres of resistance - which nonetheless fought on even more stubbornly and ferociously. Till 12th of June a small group of soldiers together with major Gavrilov kept on fighting. It was in the north-west section of the external earthwork where Gavrilov emptied his TT pistol and on July 23, the nazis finally captured the zounded and exhausted Major Gavrilov. He was liberated from a nazi concentration camp in April 1945. The last days of the defence are covered with legends. During those days the inscriptions were made by the last defenders. They said: "We'll die but we'll not leave the fortress". "I'm dying but I won't surrender. Farewell, Motherland. 20.VII.41." The enemy couldn't get a single Red Army standard on the territory of the Fortress. At the critical moment Junior Sergeant Rodion Semenyuk and two other soldiers buried the standard of the 393rd Anti-Aircraft Artillery Battalion in one of the casemates on the East Fort west side. Fifteen years later, Semenyuk returned to Brest, found the spot and dug the standard up. The basements of the White Palace of the Engineering Headquarters building, the barracks of the 333rd Rifle Regiment were the last centres of resistance in the Citadel. The enemy used the disposal to put an end to resistance here. General Schlieper, commanding officer of the German 45th Division, wrote in one of his reports: "The 81st Combat Engineers' Battalion was given the task of blowing up this building on the Central Island ... in order to put an end to the Russian troops' flanking fire at the North Island. Explosives were lowered from the roof of the building towards the windows, then the fuses were lit. When they exploded, we could hear the Russian soldiers screaming and groaning, but they continued to fight." In his book, Rudolph Gschöpf writes: "We only gradually managed to take one defensive position after another as a result of stubborn fighting. The garrison of the so-called "0fficers' Corps" on the Central Island only ceased to exist with the building itself ... The resistance continued until the walls of the building were destroyed and razed to the ground by more powerful explosions". Lieutenant Kizhevatov, one of the leaders of this sector's defence, died in the last fighting. A granite block bears a five-cornered star and a marble plaque with the inscription: "Soviet frontier-guards led by Lieutenant Andrei Kizhevatov heroically fought against German invaders here, in the former building of the 9th Frontier-Guard Station of the 17th Frontier-Guard Detachment. The name of Andrei Kizhevatov was given to a new frontier-guard station." Nothing remains of the old frontier-guard station today. On July 8, the commanding officers of the 45th Division, which was laying siege to the fortress, sent a report to their general headquarters that the fortress had fallen. This was not entirely correct, however. Tiny centres of resistance continued in individual sectors of the Citadel and the Kobrin Fortification from late June to mid-July. Until the very end of July, however, rifle fire and short bursts of machine-gun fire continued to ring out from basements and half-destroyed casemates with small groups of soldiers inside. After that, solitary fighters bravery fought on. Even though they were starving and covered with wounds, they asked no mercy nor sought to give themselves up. No one knows when the very last shot was fired in the fortress, who the last defenders were, or how they died. In August, 1941, however, a German military magazine carried a photograph on its cover, showing nazi flamethrowers still operating in the Brest Fortress. The defenders of the Brest Fortress soldiers of 30 nationalities of the former Soviet Union fulfilled their duty. They were able to withstand and overcome difficulties through their courage and fighting skill. It was the greatest deed in the history of the Great Patriotic War. The Soviet Union has honoured the feat performed by the defenders of the Brest Fortress. On May 8, 1965, the Presidium of the Supreme Soviet of the USSR awarded the title of Hero Fortress to the Brest Fortress, along with the Order of Lenin and the Gold Star medal Major Gavrilov, commanding officer of the 44th Rifle Regiment has been awarded the title of Hero of the Soviet Union, Kizhevatov, the head of the 9th Frontier Guard Station was posthumously awarded the title of the Hero of the Soviet Union. About 200 of the defenders were awarded with orders and medals. In 1956 The Museum of the Defence of the Brest Fortress was opened. We have never celebrated the ending of this war, or the one before it. in the United States. Unfortuanately I still have regular arguments with people who are painfully ignorant of the role Russia played in the winning of WWII, so ignorant that somehow they are totally unaware that the United States and the Soviet Union were allies in that war, and that the sacrifices of the Russians were the greatest of any of the allies. When you assert that millions of Russians dies fighting that war, they will assert that it was Stalin who did the killing, not the Nazi regime. When they are presented with facts from authorative sources, they sometime retreat from those assertions, but they never give up believing them. Then they rather exaggerate the U.S. role in the war. They do not even bother to count the months that the U.S. was actually difrectly fighting in the war, from June of 1944 to May of 1945. While the rest of Europe and Asia had been fighting since 1939. A few days ago I had to make this argument on an editorial page in one of the major American newspapers. This lack of historical awareness is a testiment to the sorry shape of the educational system in the U.S. I know, because I argued with one american teacher on this matter some months ago.This victory is the result of our people heroic deed. Well, the U.S. did play a role in the winning of that war, but they did not enter the European theater until very late in the game. The Russian had already pushed the Nazi armies out of their territory and also that the Eastern Front in that war was the largest theater of war in history with an unprecedented amount of ferocity, carnage, destruction, loss of life. The bulk of the events of the holocaust occured on the Eastern Front, nearly all the death camps and other concentration camps, ghettoes, pogroms, death marches, etc occured on the Eastern Front. The nations of the Western Front in Europe were relatively easily subdued or had governments that collaborated with Germany to varying degrees. The Russians started fighting this in June of 1941 with the start of Operation Barbarossa, and ended on may 9, 1945 as a result of the Berlin Offensive which was an operation executed by the Soviet Army and which resulted in the unconditional surrender of Germany. Much more of the fighting on the Eastern Front took place near or in the heavily populated Western regions of Russia, while on the Western Front of the war, a large amount of the battles took place in relatively unpopulated area, like the beaches of Normandy and the Ardennes Forest. Essentially the Russians fought ten huge campaigns against the Nazis, in three separate periods of the war, each campaign occuring seasonally. During the first phase of the war, between June,1941 and November 1942, there were three large scale campaigns, basically two Summer/Autumn campaigns and one Winter. During this period the Nazi force pushed the Russians deep into their own territory. The second phase of the war ran from November 1942 to December 1943, consisting of two offensives, the Stalingrad offensive and the Kyiv Offensive and Kyiv Defensive. The third and final campaign starts with the Winter campaign of 1944 which lasted from January 1944 to Early June 1944. This is the Dnieper/Carpathian offensive, where the Soviet Army has recovered all of its own territory and forced the German army over the Carpathians back into Eastern Europe. Basically the Red Army is well into Europe almost 4 months before a single Anglo/British boot sets foot in Normandy. The last set of Offensives of this third period of the war, between January 1945, and May 9th 1945 and see the Russians have already reached the borders of Austria by this date. This consists of two large offensives, the Vistula/Oder offensive and the Prague Offensive. This last period is known as the European Campaign because the Russians are no longer fighting to regain their own territory, but have entered Europe, pushed the Germans out of Poland, Hungary and Czechoslovakia in the first six to eight weeks of 1945 and are poised on the border of the Reich, waiting for the Americans to launch the invasion of D-Day. The Russians basically consolidated their positions in Eastern Europe and then waited to co-ordinate their attack on Austria and Germany proper, with the Anglo/American invasion of France on June 6th, 1945. Before D-Day, it is fairly certain that Germany has lost the war and while it may have taken longer without Anglo/American entry into the war, the Soviet Army most certainly would have defeated the German forces even if the American,British and other allied forces of Western Europe had not entered the war at all. The Russians had pentrated so deeply into Eastern Europe and were at the borders of Central Europe four months before the D-Day landing. D-Day more than anything, was launched at this point largely out of fear in Western Europe, that the Russians would have pushed through Germany and to the borders of France by June 1945 had they not agreed to stop their forward movement from Budapest and the Oder in February, 1945. The Russians were fighting the forces of Hitler and the Nazis from mid 1941 to mid 1945.In 3 years and 11 months they pushed the bulk of the German Army from the edge of Siberia up to the border of Germany and Austria. They had pretty much pushed the Nazi's out of 3/4ths of continental Europe before June 6th 1945. Their role should have a much greater prominence in the histories of this war as they are told outside of Russia.